I am wishing you all a Happy Thanksgiving! I'm taking the week off from Live Your Music for the holiday. I've been thinking about how thankful I am to have so many inspiring guests on my show. I am also thankful for all of you who listen to the show and tell your family and friends about the shows! My first show was last year on December 4, 2013. Since then I've hosted 44 shows. I've put together a new montage with guests who have been on the show. 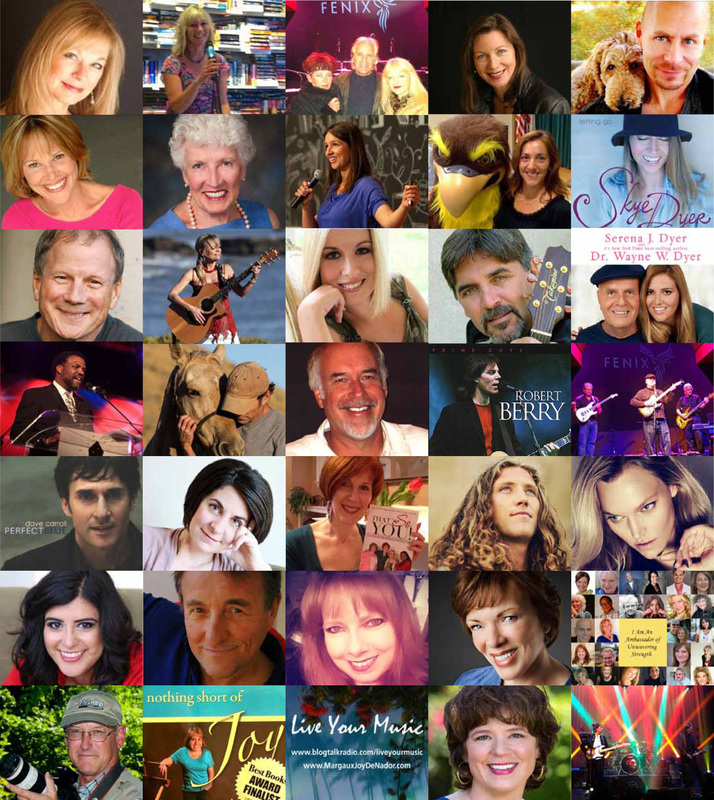 Thank you to all of my Live Your Music guests!! Debra Oakland, Betsy Gutting, Dudley DeNador, Leslie Keenan, Michael J. Chase, Michelle Phillips, Bobbie Neely, Sara Lahey, Jenny Walsh, Skye Dyer, David Lent, Michelle Chappel, Anna Taylor, Mark Stanton Welch, Serena Dyer Pisoni, Merl Saunders Jr., Alex Woodard, Chuck Ballinger, Robert Berry, Robert Crane, Dave Carroll, Vicki Savini, Ginger Burr, Jake Ducey, Sarah DeAnna, Diana Dorell, Alan Denman, Jean Baily Robor, Nancy Anderson, Judy O'Beirn, Duane Brovan, Julie Genovese, Maria Danly, and December People (Robert Berry). I am happy to announce that I'll be teaching a FREE introductory meditation and visualization class at Embrace Yoga in San Rafael. The class will focus on a fun "freestyle" meditation that I've been doing for almost ten years. I never thought that I'd like to meditate but I love this way of doing it. I've found that meditation helps me relax, focus, and increases my energy. During the class, I'll also being leading a guided visualization where you'll visualize your life as you most want it to be. The FREE class is from 8-9am on Saturday, December 13, 2014 at Embrace Yoga in Marin. I'll be on Live Your Music again on Wednesday, December 3, 2014. My guest for the next show will be Shiloh Hobel. We'll be talking about her music, the music industry, the Grammys, West Coast Songwriters, and I'll play a song by her during the show. If you want to hear any of the shows, you can listen to recordings for all of my Live Your Music shows by clicking here. Please forward this message to your family and friends who would enjoy listening to recordings of the shows.